A small group of dedicated supporters gathered on October 21, despite steady rain, to celebrate the Herbert Run Greenway (HRG), a 1.4 mile pathway that begins at the Joseph Beuys Sculpture Park and follows the Herbert Run stream as it meanders across UMBC’s campus and through the university’s Conservation and Environmental Research Areas. The event included a ribbon cutting and community hike to enjoy recent improvements designed to increase the HRG’s visibility and to make it a recreation destination on campus. These updates include new directional signs labeling the route and trail map brochures, as well as an expanded website. Patricia LaNoue, director emerita of interdisciplinary studies, advised the group of students who designed the Herbert Run Greenway in 1995, and she has stewarded it ever since. The greenway opened in 1996, but has been a hidden gem for much of that time, unknown to many in the campus community. LaNoue and a core group of students are dedicated to changing that. 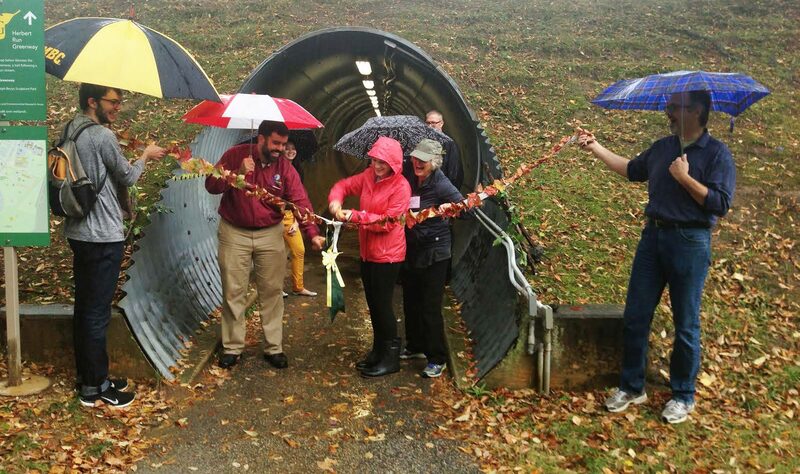 Sarah Burton ’16 cuts a ribbon at the start of the Herbert Run Greenway. Ethan Griffin ’18 holds the ribbon (left), and Patricia LaNoue cheers them on (gray cap, center). Griffin hopes the entire campus community will utilize the HRG for a variety of purposes, including both recreation and research in areas from geography and environmental systems to urban design to life sciences. “We want faculty, staff, and students to use it, and we also want them to seek to understand it in the context of their disciplines,” he says. Griffin and UMBC Eco Ambassadors now provide trail tours each spring at UMBC EcoFest and on a rolling basis throughout the year, and there is interest in expanding this public engagement. “Every year we hope to involve more students, staff and faculty in leading tours as part of orientation for incoming students and new faculty and staff,” says LaNoue. Sarah Burton ’16 gives a tour of the greenway. The HRG runs alongside UMBC’s new events center, currently under construction, and the building’s footprint carefully avoids several historic trees that have been in place since before the American Revolution. That project has provided some funding for trail updates, to mitigate any impact of construction on the greenway. Looking ahead, the HRG team plans to create an advisory council to preserve the greenway as UMBC continues to grow, and to facilitate maintenance. LaNoue sees the greenway as an essential complement to classroom experience at UMBC, connecting students to the campus, themselves, and each other in unique ways. “It provides a way to see elements of nature on campus and find a place for reflection and repose,” says LaNoue, who notes that students who traverse the greenway “discuss ethics and religion, policy and land use, ecology and athletics,” while also taking in the sound of the stream and the tracks of local wildlife. 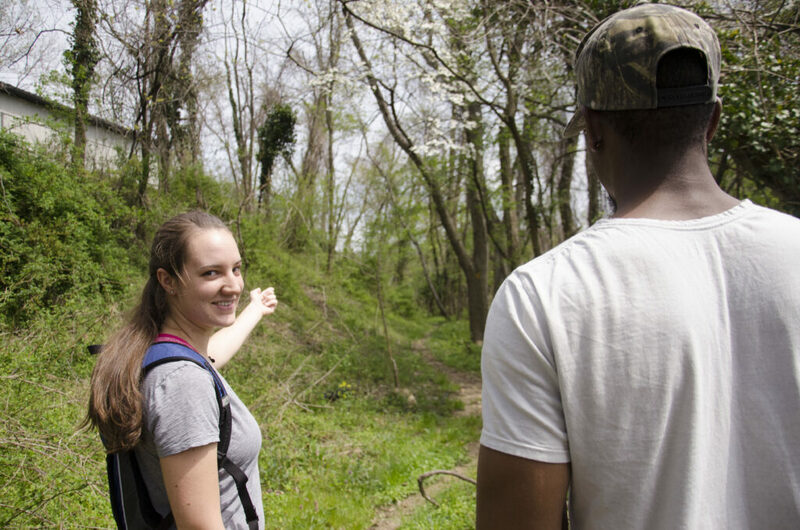 Image: Sarah Burton ’16 (right) gives regular tours of the Herbert Run Greenway. All tours include a stop at Pig Pen Pond, shown here. Photo by Tanvi Gadhia, UMBC sustainability coordinator.